The Canadian government has recently moved to nationalize the expansion of the controversial pipeline. But the ruling Thursday by the Federal Court of Appeals is requiring the government to assess the project's possible impact on southern-resident killer whales, which use transboundary waters of the Salish Sea. Concern for critically endangered southern-resident killer whales has sunk the approval of Canada’s controversial Trans Mountain pipeline expansion. Approval for the expansion was revoked by a federal court in Canada, which ruled Thursday that the effects of the pipeline on orca whales were not addressed and the concerns of First Nations were not adequately considered. The Federal Court of Appeals is requiring the government to redo its consultation with First Nations and assess the impacts of the project on the whales. The ruling comes after more than a dozen First Nations, the B.C. cities of Vancouver and Burnaby and several environmental groups petitioned the Court of Appeals after the pipeline’s expansion was approved in 2016. Developer Kinder Morgan issued a statement Thursday stating the company is suspending construction on the project, at least for now. The pipeline would run for more than 700 miles — alongside a line that has been in service since 1954 — and would move 890,000 barrels a day from Alberta tar-sands deposits to the coast. A second pipeline is planned to be built from the interior of Canada to the coast at Burnaby to carry tar-sands crude for export. The project was considered not only for jobs, but for better oil prices that Canada hopes to garner in overseas markets. The decision was a major victory for Canadian First Nations, environmental groups and U.S. tribes that opposed the pipeline expansion. Critically endangered southern-resident killer whales face a sevenfold increase in oil-tanker traffic through their critical habitat if the project is built. Many First Nations also have adamantly opposed construction of the project through their territories. The Trans Mountain expansion is projected to balloon tanker traffic from about 60 to more than 400 vessels annually as the pipeline flow increases from 300,000 to 890,000 barrels per day. The tar-sands oil carried by the tankers would be especially disastrous in the event of a spill in the bays and coves and swift currents in the transboundary waters of the Salish Sea because the oil sinks, and comprises an ever-changing mix of chemicals added to the thick oil to make it flow. Down to just 75 animals, the whale pods that would share the water with the tankers is sliding toward extinction. The whales are threatened by vessel noise underwater, interfering with their ability to hunt, as well as possible pollution from an oil spill. 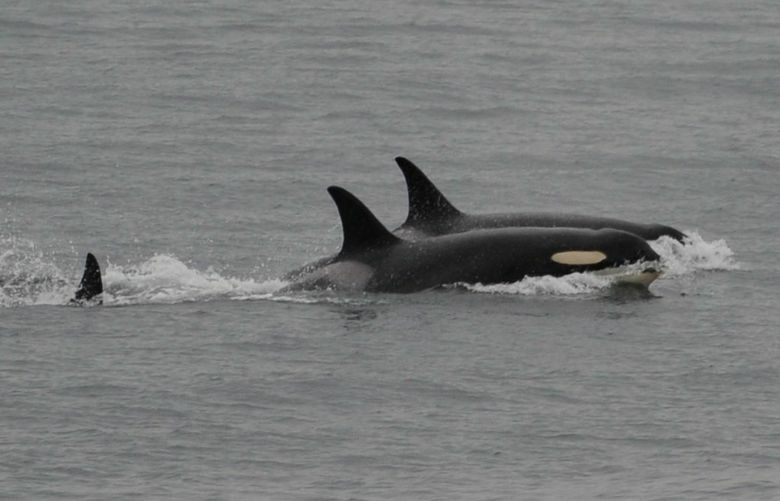 Canada’s National Energy Board recommended approval of the project, even as it acknowledged it would set back recovery of southern-resident killer whales, a protected species in Canada. The board said the effects of marine traffic were beyond its scope. The court disagreed, sending the project back for reconsideration. 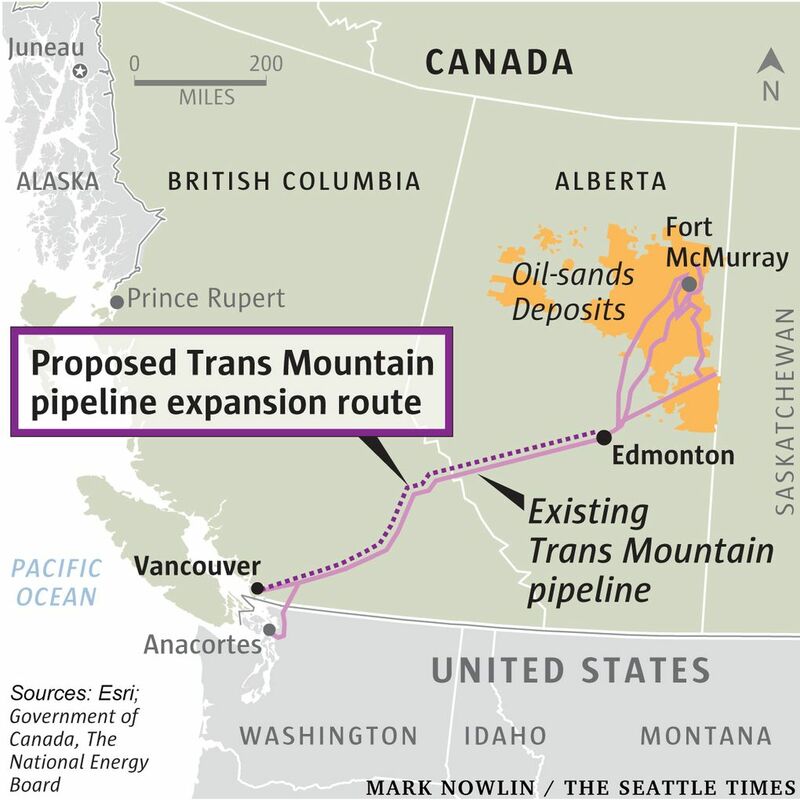 Canadian Prime Minister Justin Trudeau approved the project — then in May nationalized it in an attempt to ensure the pipeline expansion would be built, despite extensive controversy on both sides of the border. The court decision does not affect Canada’s purchase of the project from Kinder Morgan, Anderson said in his statement. Kinder Morgan shareholders voted overwhelmingly, 99 percent, to approve the $4.5 billion Canadian (U.S. $3.4 billion) sale of the pipeline to the government shortly after the court decision was announced. Canadian Finance Minister Bill Morneau didn’t say whether the government would appeal the court decision, but said it will review the decision to ensure the environment is protected and that it meets obligations to consult with indigenous peoples. Environmental groups and many First Nations hailed the ruling. “Smothered by choking wildfire smoke this summer, we’ve experienced a taste of what climate change is bringing. This environmentally destructive project should never have been approved and the Trudeau Government must stop construction immediately,” said Grand Chief Stewart Phillip, President of the Union of British Columbia Indian Chiefs (UBCIC). “Our wild salmon and the orcas that they support are critically under threat. The increased tanker traffic that the … project proposes is entirely unacceptable,” he said. Some environmental groups said the ruling should give Canada all the reason it needs to walk away from the controversial project for good. Washington Gov. Jay Inslee has often repeated his opposition to the project, and did so again Thursday. Washington tribes also celebrated the decision Thursday. The ruling handed down Thursday was sweeping and far-reaching. The judge found that the recommendation for approval of the expansion by the National Energy Board was so deficient it could not be relied on. Missing was any consideration of the effects of marine-shipping traffic from the project, including on threatened orca whales, an exclusion the court found was impermissible: “The Board unjustifiably defined the scope of the Project under review not to include Project-related tanker traffic,” the ruling stated. “The unjustified exclusion of marine shipping from the scope of the Project led to successive, unacceptable deficiencies in the Board’s report and recommendations. As a result, the Governor in Council could not rely on the Board’s report and recommendations when assessing the Project’s environmental effects and the overall public interest,” the ruling stated. Such a strong decision is a major stumbling block for the project, said Jan Hasselman, of Earthjustice in Seattle, who represented Washington tribes in their opposition to the pipeline expansion before the National Energy Board.